Several weeks ago, Vanestra, queen of a neighboring land, rode into town. Ever since, the king has fallen in love with her, and his health has been deteriorating. Strange things have been happening around the castle and Vanestra's men have taken over many of the important military positions. Prince Collin called a secret meeting with his most trusted friends and advisers do discuss the matter, but Vanestra discovered their plans and had them all thrown into the dungeons. With their fates unknown, Maginos, the mystic cast an irreversible spell turning everyone into mice to make their escape. Vanestra has to be stopped, the King must be saved, but first you need to make it out of this situation alive! 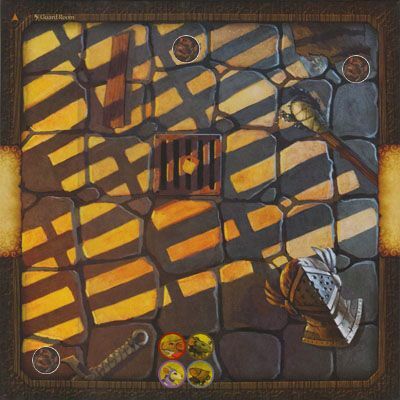 3 Rat Warriors enter the Jailer's Room. The battle for freedom is on! A successful Special Search on the space with the helmet will reveal a hidden item. Escape the castle by getting all mice to the old gnarled tree space in the courtyard before the hourglass marker reaches the chapter end marker of the chapter track. Post 3: Minion defense roll if needed. Post 4: Can be a reaction, totaling of cheese, or whatever. Copy and paste the following into the roll field when clicking the roll button. To search a space type 1d73 into the roll field and search into the comment field: Search 1d73 = (56) = 56. Look up the number in the search deck and if it is already taken roll again. When attacking a minion a player may roll defence for that minion. Abilities, Search Cards, Minion Stats - A list for PBF use. If you are going to be unable to update for an extended period please let me know and I will take control of your character to keep the game moving. - Keen Eye - 1 - Use before search, success except on roll of cheese. Collin has received one cheese from his Born to Lead ability. If you guys could remove some of the posts below and we can let Nez take his turn. Argh, rats! yelled Nez and before anyone could speak, he charged the closest rat with his hammer above his head.
) [+] Can we also post stats for the minions? I think their defense is 2 (?) Can't remember how much life rats have either... 1? Rat Warriors have 1 life each. What do you mice think? How shall we handle them? Normally, Nez would ask advice, but this rat was so close, that it totally startled Nez, not leaving him much time to think. Thinking is not his strongest quality anyway. For his following turns, Nez is planning on doing a special search, while keeping an eye on his friends, now that the imminent threat is taken care of. Not two rolls. She would add 2 to her roll. So based on the roll above she can move up to 5 spaces this turn. ok - so Tilda could reach any of those Rat Warriors. Shall she just jump ahead and try to smack the middle warrior? If there are no minions on the board after the last mouse on the initiative track has taken a turn, place 1 cheese token on the minion cheese wheel. Continue to do this each time the last mouse on the initiative track completes a turn and there are no minions on the board. Killing all the minions quickly may mean that there is not enough time for everyone to search/share/explore before adding cheese to the wheel. got a long bow, filch want? Sharing is a free action as long as the two mice are on the same or adjacent spaces. Since Filch is the only archer in the group we can assume he takes it. Don't forget about the special search on this tile. btw are we playing any sort of house rules? Anyone can search the helmet and find the Tinkerer's Treasure but they would then have to share it with Nez so he can use it. Right now Collin has searched successfully on this tile and cannot perform a search action again. I think the only house rules will be the movement of minions. In the rules it is the player lowest on the initiative track that performs the rolls. In our game I will take control of the minions.